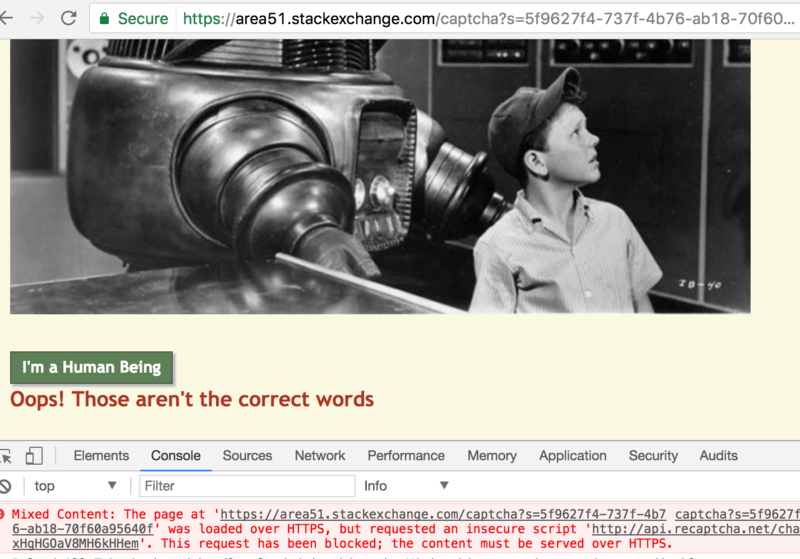 Captcha doesn't work properly at Area51 as the images aren't shown when I'm on HTTPS version of the site (https://area51.stackexchange.com/), although it works when I'm on HTTP (http://area51.stackexchange.com/). Mixed Content: The page at 'https://area51.stackexchange.com/captcha?s=5f9627f4-737f-4b76-ab18-70f60a95640f' was loaded over HTTPS, but requested an insecure script 'http://api.recaptcha.net/challenge?k=6LduHQgAAAAAAGeXUpgp89IxHgHGOaV8MH6kHHem'. This request has been blocked; the content must be served over HTTPS. Browse other questions tagged area51-meta bug support .